Welcome to the Capitola Vacation Rental. Located just a few steps to Capitola Village, you and your guests will thoroughly enjoy this beautifully remodeled 2-bedroom vacation home. This split-level beach house has 2 bedrooms with a new Queen bed in each room. 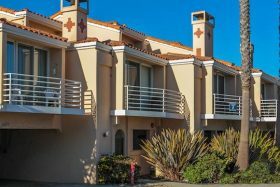 This is the perfect place for 2 couples to enjoy a getaway to Capitola or a family of 4 to spend time reconnecting in our quaint Village. Located upstairs above one of the cafe’s in Capitola Village, enjoy views of downtown Capitola at this Chic Capitola Village Rental! 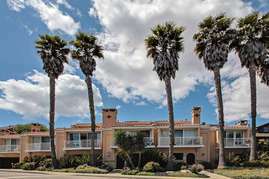 Just one block to Capitola Beach and steps to the shops and restaurants in town. This home is great for members in your group who may have trouble with stairs or prefer a home on the ground level. The Capitola Dreamin beach house has fabulous ocean and Capitola Village views. Watch the sun rise and set from the two fabulous balconies at this stunning vacation rental. windows and front balcony with an ocean view overlooking the quaint village.